Memorial Day Weekend BBQ Recap! Saturday and Sunday’s Bull’s-Eye BBQ Sauce activations (Fred Meyer and Safeway, respectively) went off well, and a good number of people got the chance to try out the new Regional flavors. We were joined by the awesome folks from KISW on Sunday, so we also got some great music for a couple of hours. Next weekend we’ll be at the Capitol Hill QFC, and Fred Meyer in Kent, working our Bull’s-Eye mojo! And what a weekend it is! Saffron and I will be cranking out two different retail activations – one Saturday and one Sunday – to get folks geared up for their holiday cookouts. More on those afterwards. It is my sister-in-law Mary’s 40th birthday party Sunday. Since I’ll be busy “saucing up Seattle”, Christene is going to have to man (person? woman?) the 22 in WSM to get the briskets and butts cooked for the party. This will be a new experience for her; the only other time she was responsible for a long cook, I was on hand to help out. She’s seen it done often enough she should do fine, as long as her dad man’s the starter torch. The University Street Fair – All Porked Out! 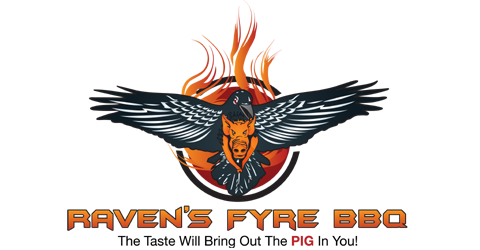 This last weekend the Raven’s Fyre Bull’s-Eye Team – Christene, Saffron, and I – were at the University Street Fair “Saucing up Seattle”. Let me tell ya – we definitely sauced up that event. Saturday, with the sun shining and the weather warm, we put out over 2000 samples in the span of 9 hours. By the numbers, that worked out to 49 bottles of sauce and about 20 pork butts. That turned out to be more than I had expected, so we ended using all of our reserve pork that was set aside for Sunday. Translation: More pork had to be cranked out Saturday night. After packing up and heading out, it took 3 different stops (Sam’s Club and two Safeway stores) to get the 18 butts we figured we would need for Sunday. Knowing that the weather would be colder and wet, and that the event would be an hour shorter, we figured on about 200 samples less, so 18 butts would be perfect. Got them on the smoker about 10:30 that night, cranked up the temperature, and had them ready by 8:30 Sunday morning, and we were off. Who knew that Sunday would be even busier? Even with the rain and the wind and the occasional hail, we were on a pace to hand out about 3000 samples. A lot of people who tried the Texas and Memphis sauces on Saturday came back to try the Carolina and Kansas City on Sunday. The pork finally ran out around 3:30, and so we finished out the day sampling on oyster crackers. Definitely a great time, and a good run-up to being ready for the Fremont Fair – our next big sampling event. We’ll definitely be increasing the amount of pork on hand for that one! Sunday, we’re delivering pulled pork and sides to some students who bought themselves a BBQ dinner from a UW student charity we help support. Probably the best meal they’ve had all quarter! Knocked Out Two Sampling Sessions! 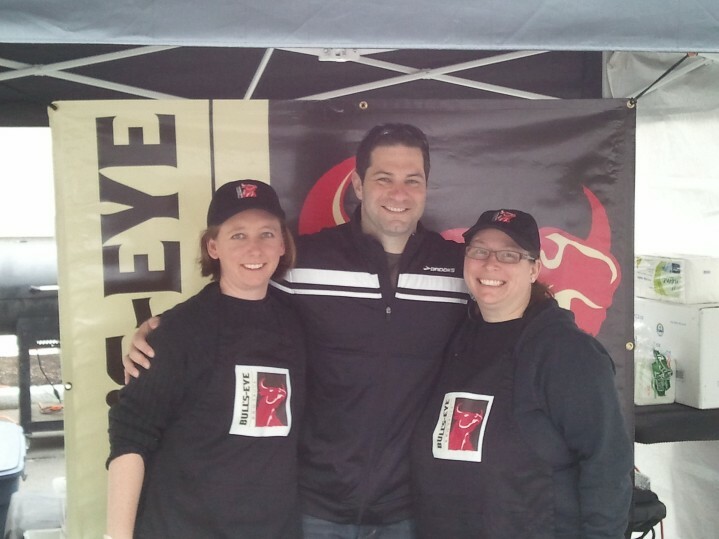 Christene and I worked a Bull’s-Eye Sauce sampling at the Burien Fred Meyer on 1st Avenue South, and Saffron from Bush Kitchen joined us to hand out samples at the Washington State Spring BBQ Championship. The lovely ladies from KISW were handing out goodies at Fred Meyer, while 710 ESPN joined us at the competition. After sampling some awesome Bull’s-Eye and pulled pork, Mike Salk did a little photo-op with Christene and Saffron (they’re much cuter than I am). Looking forward to the South Seattle Safeway in Roxbury this weekend!